Harbert, Michigan Furniture repair, refinishing, restoration. Harbert, a Harbor Country community, is home to a Swedish Bakery that speaks to the Scandinavian founders of this thriving little resort community that was created after the turn of the century. Pictured above is the annual “Umbrellas of Harbert” charity auction which features a display of original, hand-painted 9 ft. Market Umbrellas designed by various artists displayed along Red Arrow Highway through out the summer. 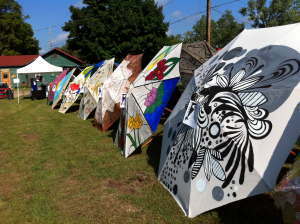 The Umbrellas are then auctioned off in August and the proceeds benefit different local charities. Wood Menders is proud to offer our services of Wood Furniture, Leather and Metal Refinishing and Repair to the lovely Village of Harbert. We specialize in antique table and chair restoration and look forward to exceeding the expectations of more restoration clients in this wonderful lakeside community. Call today for a free quote on your next Furniture Restoration Project.